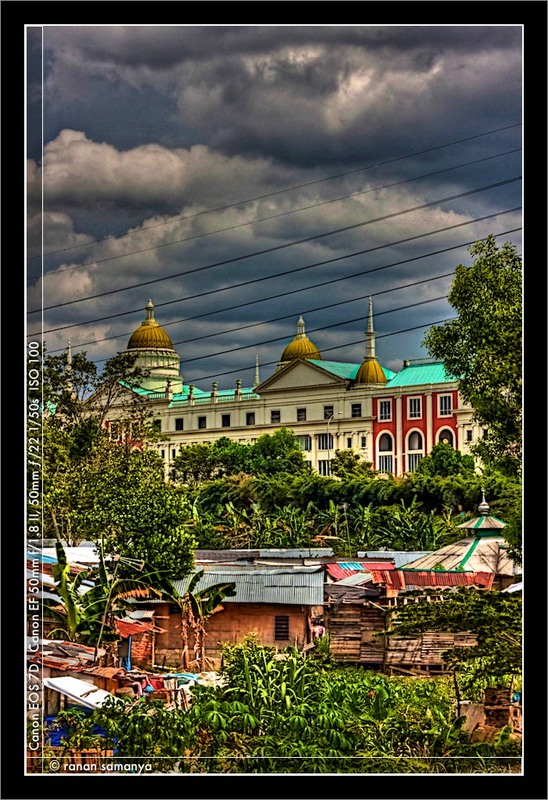 Illegal quarters in Batam island is an integral part of this island’s life. Also known as ruli – rumah liar (illegal house), these quarters can be seen almost everywhere, even beside major roadways. In a way, these quarters show the great work opportunities Batam has for immigrants. People in these quarters have decent jobs ranging from operators in one of the many industries here to cab drivers. The quarters have developed much such that it is very common to see either a church or a small mosque in each of the community. This quarters community above is unique in the sense that it grew behind a superblock which has never took off (another typical Batam business style) – Menara Imperium (Imperium Tower). Do you notice the high tension cables above? They were moved a few hundred meters from the original positions so that Menara Imperium can be built. Not too distinct on the foreground are a few edible plants: cassava, corn, and banana. Yes, as with other similar communities, the illegal quarters in Batam are almost self sufficient. I took three bracketed frames with 2 stops difference. The shutter-speed printed here is the slowest with +2 stops. It was such a bright day that I had no problem in pushing the aperture down to f/22. Tonemapping was done with Photomatix. Color saturation of the three yellow domes of the Imperium complex were increased manually in Aperture to pop up the color.